You had the best intentions. You were going to save a bundle on your grocery bill by growing your own vegetables and herbs. Instead, you broke your budget buying every gadget from the big box gardening store – not to mention the pricier mature plants and the chemicals to make them grow faster and produce more. It happens to the best of us. I now grow almost all of the vegetables and some of the fruits my family eats through the year. Our grocery budget dropped by over $40 per week in the third year of my gardening efforts and it gets better every year. The following are my favorite tips and tricks that I’ve learned over several gardening seasons – many of them the hard way. One of the biggest mistakes new gardeners make is wasting money on plants that are intended for climates in which they do not live. It is easy to get lured in by the beautiful, exotic plants meant for tropical climates or the crisp, sweet apples that grow better in cold climates. Surely, you will be that expert gardener who figures a way to make it work, right? Wrong. Unless you can figure out how to control the temperatures and growing seasons in your yard and fields, you are wasting time, money and garden space. If you are lucky enough to have a greenhouse, you might be able to grow some tropical plants, but don’t plan on feeding your family homegrown pineapples or oranges if you live in Vermont. Know as much as you can before digging in. Study your hardiness zone. Know approximately when your last frost will be. Have your soil tested. Talk to experienced gardeners in your area. If you read online sites, make sure the advice you get is for your hardiness zone. Don’t take as gospel advice given to someone who lives in Oregon when you live in Florida. You can easily spend hundreds of dollars on seeds, bulbs and tubers each year if you grow a large garden. Cut that amount dramatically by collecting the seeds from the best fruits and vegetables in your garden. Most seeds will dry nicely on a paper towel. Mark the towel with the name of the plant and the date and then transfer that information along with the seeds to a paper envelope for storage once they are completely dry. It is also a good idea to test the seeds for germination before it is too late to order more for starting indoors. Insecticides harm more than the bugs they are meant to kill. They kill good things in the soil too and can harm birds and other animals that wander into your garden. If you have a problem with insects, larger bugs and eggs can be picked off by hand, but some of the best natural insecticides are snakes, frogs and birds. Make sure there are plenty of natural habitats for birds. Some shrubby, overgrown areas where fields meet woods are favorite spots, but if you want a perfectly manicured lawn put some nesting boxes up along with your feeders. Grow trees and shrubs that will provide berries in the winter months and make sure there is water for your feathered helpers throughout the year. This can be a challenge in colder climates, but it is important if you want to attract birds to your yard. It is also a good idea to keep at least one birdfeeder full year round. Many birds that feed mostly on insects during the summer months also enjoy a meal of good quality seed. It is also a good idea to keep cakes of non-melting suet available to attract titmice and woodpeckers. While you don’t need every gardening gadget found at your local home and garden center, you should invest in good tools. General purpose and trench shovels, solid and pliable tine rakes, hoes and mulch forks are all handy long-handled tools. 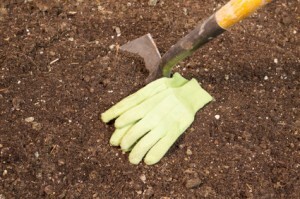 For hand tools, look for a trowel, bulb fork and weed fork. The best cutting tools for a vegetable garden are a long-handled lopper and smaller pruning shears. The loppers typically don’t come into play until the end of the season when larger plants like okra need to be cut down. The most important thing is to make sure you clean your tools thoroughly and store them properly over the winter months so they don’t rust. This will ensure your tools last a good long time and you aren’t wasting money replacing them more often than you should. Most home gardeners do not need to use chemical fertilizers on their vegetable gardens. It is common for those new to gardening to think frequent application of commercial fertilizer will deliver a high yield. Sometimes the opposite is true. Plants that are fertilized too much may look beautiful, but they fail to flower and produce fruit or vegetables. Instead, use composted yard and garden waste. You can purchase commercial composting bins or build a pen with fence posts and chicken wire. Combine brown (fall leaves, sawdust, shredded newspaper, fine wood chips) and green (grass clippings, raw vegetable and fruit waste, coffee grounds, tea leaves, egg shells, barnyard manures) using the ratio of about 25-30 parts brown to 1 part green. If you have too much brown the decomposition will be slow and if there is too much green your compost bin will get a bit odiferous. When done right, this home composted material will feed the plants in your garden and help deliver beautiful, high-yield plants. Your initial investment in bin or pen materials will be returned many times over. Guest Post Author Bio: CollegeMom is a staff writer at ConsumerFu.com and mother to two college-age daughters. She is an avid gardener in hardiness zone 7b. My biggest piece of advice is START SMALL. Grow just herbs the first year–they’re easy, and they have a great ROI! Small is cheap, and you’ll then know whether it’s for you. BTW, we had over a dozen fruit trees in our property when we moved in. We’ve never gotten a single piece of fruit off any of them. Between the deer, groundhogs, and squirrels, there’s never any left for the people! Hi Jenny – that’s great advice! I’m now adding raised beds on two sides for specialty crops. At first it seemed like an easy plan…but the weather is fighting me on a daily basis. It won’t stop raining! Our fruit trees are just now mature enough to produce fruit. I’ve kept it small intentionally, but I’ve battled blight on the pears and apples from the second year. This year I’m purchasing a better air mask for when I’m spraying the trees. I was about to give up on them until we got a taste of our apples last year and they were so perfect I decided to spray and treat for blight instead. These are great tips. We only use containers for our plants since we live in an apartment, but the same goes; select local plants that will thrive in your climate. We’ve learned the hard way that pretty, dainty flowers just can’t stand the heat and arid conditions of our region. Succulents and hardy plants do much better. People laugh when I tell them I grew watermelons in a tiny strip of dirt on one side of our patio when we lived in an apartment. I also grew tomatoes and zucchini. Now that my herb garden is in full swing, I think I would stick to that for container gardens now. They are beautiful when they flower, most are fairly hardy and they are all very useful. I keep thinking how we’d love to do this and you offer excellent advice. But how much time does it take to do what you do? I could not possibly give it more than an hour or two a week. cj, it is a full time job to do what I do. We live on old farmland though and are out with actual farmers who help each other. I have extensive gardens and am very behind this year because I went dared to go on vacation with my husband! Why don’t you keep it small to start. You can grow tomatoes in containers on your back porch/deck/patio. Grow some herbs like basil. Some take longer than others to grow. Basil and dill practically grow themselves and the basil smells so amazing. I also like pineapple sage (very easy to grow, but gets large and has lovely deep pink/red flowers all summer) and citrus mint (spreads everywhere, but smells great when the grass is cut!). Start small so you don’t get discouraged. Who knows, as time goes on you may find you enjoy it enough to take it to the next level. Also, if you live near farmer’s markets or other areas where you can get fresh produce in bulk, you can still take advantage of canning and freezing produce others grew. It’s not as cheap as growing it yourself, but then you saved all that time in the garden, right? Right you are!!! There is a farmer’s market opening soon very close to our home. Can’t wait!!! Thank you for such a prompt and thorough reply. This is rare online. Very rare. Great that you are so close! I still buy from farmer’s markets when I have a crop failure – like last year. I barely had any pickling cucumbers. It was a near tragedy since both of my brothers say they live for the sweet pickles I can each year. I’d hate to have them perish over a cucumber shortage! I really enjoy interacting online. Miss T has worked hard to develop a great community and I’m having a blast today! Thank you for the comments. These are some good ideas. My wife and I were debating on starting a garden this year but I think the time has passed. We need to kill the grass in the area, plus do an initial fertilizing to get the soil a little richer. Right now the soil in the area is pure clay. I would like to eventually get some top soil mixed in as well as some compost. This will be a fall project. That way by next spring when I have all the time (with no school), we will have a plot ready to go. Alan, that is a great plan! I live with clay. I use cow manure, gardening lime, sand and peat and replenish each year. Don’t worry about killing the grass. Till it into the soil for the nitrogen. Good luck. It is therapy for me. I just love my gardens. haha, we started 6 months ago and nothing is growing, but it is still a fun hobby! and seeds are cheap so apart from time, not much has been lost. Thank you for the tips! Timing sprinkling systems helps, especially during the upcoming hot months. Absolutely! Make sure to turn them off if it rains or if you’ve had a few days of rain in a row. I don’t have irrigation for my gardens. They are too large and too far from our home. I have a smallish sprayer that fits on the back of my four wheeler to keep seeds and seedlings watered, but once they are established it is up to mother nature. If we go too long without rain, I keep gallon jugs and can fit 52 jugs in the back of a cart pulled behind the four wheeler. It takes me about 4 hours to hand water my vegetable garden. Last year I think I did that only twice. So relevant! I don’t have a fancy garden, but I’ll be sure to start composting before I go out and get any fertilizer. Composting is great for a lot of things in your yard. Before our gardens were so large I would put it around trees and shrubs. I don’t have enough to go around anymore, so I’m building another composting pen this year. I agree with you on buying good tools, oftentimes people make the mistake of buying cheap tools to save money, but in the long run they end up spending more than they should because it will not last as long as they want to. Buy quality tools for a fair price is better instead of choosing cheap or very pricey ones. Always ask the sales person’s opinion, but make sure that you’re talking to someone representing the store, not the brand. In the early days I made do with tools that really weren’t strong enough or right for the job. Each season I’ve added one or two more. Initially, for the garden all I used were a long handled shovel, basic flat blade hoe, hand trowel and a weed fork. Now, if I need to add or want to replace something I will wait for a sale. This year, my family laughed when I asked for a hoe for Christmas. The old one was 18 years old and the blade was loose. I’d say we got our money’s worth out of that one! I think Jenny’s comment is great advice. Starting small is the right idea. We put in our first garden this year, and its just a few herbs, some tomatoes, and strawberries and that little bit can be overwhelming at times. Each year I think our garden will get a little bigger. It is great advice and herbs are a great way to start. All of my friends who cook love getting dried herbs from my garden. I hang them upside down to dry them and do not crumple the leaves. I store them using a vacuum sealer. Whole leaves keep their flavors longer. I make my own teas with chamomile and cat nip from the garden. I also use mint in teas and in baking. I grow both citrus mint and chocolate mint. These are all great for containers if you don’t have a yard. The mint spreads and will outgrow a small pot, but it is so hardy you can just keep splitting the plant up and repotting. Then offer the other half to a friend. My sage is blooming now and is beautiful! I actually had intentions to start a garden this spring. I had to make a decision to wait until next year when my girls are older and I could spend the time to put into the garden. I also realized that we didn’t have enough money to get one started. Is a lot more expensive to start a garden than one would think. Jules, it can be very expensive. Some of the expenses are not recurring, but like more hobbies or activities there are startup costs. one of the things I did when I started was to add up our produce costs. We eat a lot of fresh produce. I also added up canned vegetables and other food items I could replace with the garden. If you do nothing else in the first year, have your soil tested and decide on the plants you want to grow. If you have the time and money, go ahead and till the area and start feeding the soil with compost, gardening lime, peat and/or sand. What you add will depend on your soil test and the needs of the plants you want to grow. If you don’t want a muddy plot sitting around all winter you can cover it or plant different green manures and till them in at the appropriate time. Also, research different gardening methods. I’ve read a lot about no-till gardening and the lasagna layering method. Figure out what will work best for you, the time you have and the space you have. Thanks for the tips! Eventually I am going to have a home garden that has herbs, onions, all kinds of peppers, and lots of mushrooms!